The Division transferred 732 enlisted men and 15 officers to the 24th Infantry Division. All transfers were to begin on this date. The 5th Cavalry Regiment furnished 166 enlisted men, the 7th Cavalry Regiment also furnished 166 enlisted men, the 8th Cavalry Regiment furnished 165 men. Division artillery transferred 120 enlisted men to the 24th Infantry Division. All of these recorded transfers total only 617 enlisted men and show no officers. I have been unable to find where the other 115 enlisted men and the 15 officers came from. Company "A", 71st Heavy Tank Battalion with 125 enlisted men and 6 officers left Camp Chigasaki at 8:00 AM for Camp McGill, arriving there at 9:00 AM. JULY 5: The 99th Field Artillery Battalion left for Camp McGill for special amphibious training. The Eighth Army Amphibious Training Center at Camp McGill was attached to the Division in order to expedite planning and training for "Operation Bluehearts". Planing and training was supervised by Colonel Edward Forney, Unites States Marine Corps, utilizing personnel from the Amphibious Training School and a number of Marine Corps personnel who were experts in amphibious operations. Those plans called for moving the entire Division in three lifts, landing at Inchon, Korea. The training primarily consisted of practicing debarking from transport ships into landing craft by using mock-ups constructed at Camp McGill and which had been in use since February 1950. Elements of the 13th and 43d Engineer Battalions and the 55th Treadway Bridge Company were attached to the Division. Companies "B" and "D", 8th Engineer Combat Battalion moved to Camp McGill for Shore Party training. The 64th Field Artillery Battalion arrived at Camp Zama and was attached to the Division. The 5th Cavalry Regimental Combat Team began preparing for embarkation. At sometime after this date and July 14th, the destination for the amphibious landing was changed due to the unexpectedly rapid advance of the North Korean forces. "Operation Bluehearts" was carried out except that the destination was changed from Inchon on the west coast to Pohang-dong, much further south and on the east coast. JULY 10: According to the Division War Diary for this date, the 1st Battalion of the 8th Cavalry Regimental Combat Team and Battery "A" of the 92d AAA (AW) Battalion assembled for embarkation. The 77th Field Artillery Battalion completed a three day orientation in amphibious operations in preparation for moving onto Landing Ship Tank's (LST"S) and moved to Opama , south of Yokohama. 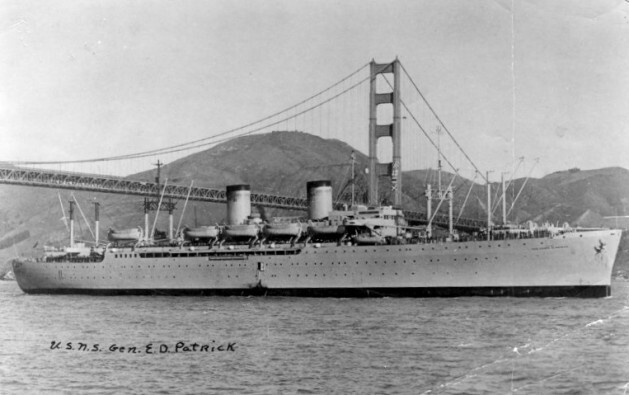 Four LST"s were each loaded with 10,000 pounds of ammunition. DUKW's of the 8082d Amphibious Truck Company then ferried 105mm howitzers to those same LST's. 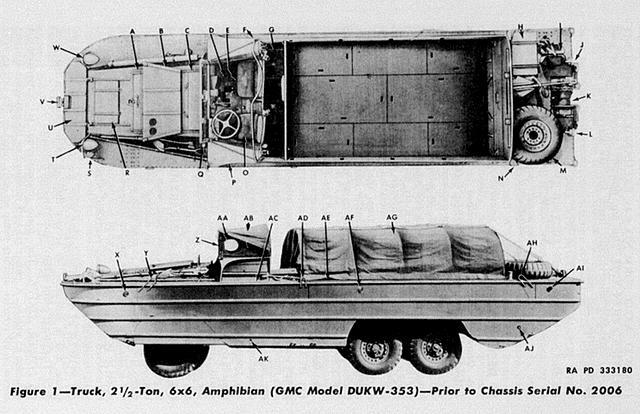 See photo and description of DUKW's below. 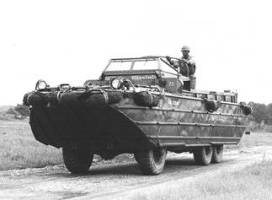 DUKW'S WERE A MODIFICATION OF THE STANDARD 2 1/2 TON ARMY 6x6 TRUCK. THE DRIVER HAD CONTROLS TO CHANGE THE AIR PRESSURE IN THE TIRES - LOW FOR DRIVING IN SAND OR OTHER SOFT SURFACES AND HIGH FOR DRIVING ON HARD SURFACES. JULY 11: The 64th Field Artillery Battalion was relieved from attachment to the Division and was to be attached to the 24th Infantry Division immediately upon its arrival in Korea. JULY 12: First Cavalry units began loading on ships for movement of the First Lift to Korea. A group consisting of Lt. Colonel Holley (Division Engineer Officer), Major Morrison (Division Intelligence Officer), Major McCord (Division Air Officer), Captain Perrin (Division Signal Corps Photographer), Captain Ware (Division Signal Officer), Captain McNary and 1st Lieutenant Breslin from the 8th Cavalry Regiment and Master Sergeant Broderick from the 5th Cavalry Regiment flew to Korea to reconnoiter the landing area. It was announced that Lieutenant General Walton (Commander of the Eighth Army in Japan) would assume command of all U.S. Forces in Korea. His headquarters was to be designated "EUSAK (Eighth United States Army in Korea), located in Taegu. JULY 13: Elements of the 8th Cav RCT sailed from the North Dock area of Yokohama. Division Artillery units, less the 82d FA Bn sailed from Opama. 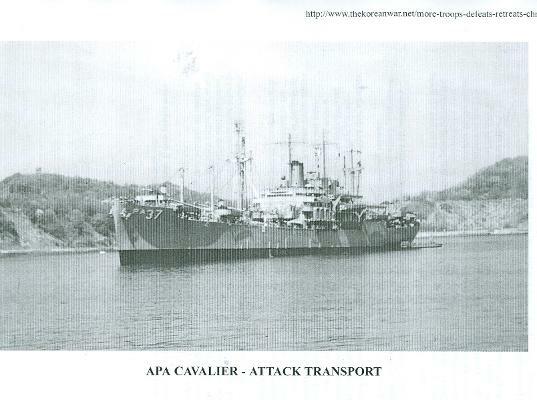 Elements of the 5th Cav RCT were loading aboard the APA Cavalier, AKA Oglethorpe (photos below) and 3 LST's The Division had received 1,450 replacements out of the 126 officers and 2,892 enlisted men needed. 14 JULY: The remaining elements of the Division Headquarters forward elements boarded the USNS Mt.McKinley. A command post was established, working closely with Navy and Marine Corps personnel. Loading of the 5th Cav RCT continued. Loading of the 7th Cav RCT and other elements of the second lift commenced. The Division Advance Party flew from Japan to Korea. a. 1st Cavalry Division (Infantry) commanded by Major General Gay a. Medical Detachment commanded by Lt. Colonel Barmand; 8th Engr (C) Bn; Detachment of the 15th QM (Quartermaster) Company; 15th Medical Bn; 8063d Surgical Team; 13th Signal Bn; Detachment 17th Ordinance Maintenance Co.; 545th MP (Military Police) Co. Regimental Anglice Detachment. b. RCT 5 commanded by Colonel Rohsenberger; 5th Cav (Infantry); Company "A" 8th Engineer (C) Bn. ; Detachment 13th Signal Co.; Bn Anglice Detachment, IPW Team 5 (Interrogation, Prisoner of War); Artillery Liaison Party and Forward Observers (FO's) from 61st FA Bn. c. RCT 8 commanded by Colonel Palmer; 8th Cav (Infantry); Company "C", 8th Engineer C (Combat) Bn. ; Detachment 13th Signal Co.; Bn Anglice Detachment; IPW Team 8; Artillery Liaison Party and FO's from 99th FA Bn. d. 16th Reconnaisance Company commanded by Captain Harvey. e. Division Artillery commanded by Brigadier General Palmer; 61st FA Bn; 77th FA Bn; 99th FA Bn; Battery "A" 92d AAA AW Bn. ; 8062d Amphibious Truck Co with 66 DUKW's). Engr Band, atchd; Company "D", 13th Engr (C) Bn. atchd; Co "A" 43d Engr Bn. attached; Two (2) Signal Detachments - 13th Signal; Company; Two (2) Ordinance Detachments - 27th Ordinance Maintenance Company; Two (2) MP Detachments 545th MP Company; Two (2) Clearing Platoons, 15th Medical Battalion; Two (2) Detachments, 15th QM (Quartermaster) Company; Detachment of Naval Beach Group One; Detachment 8062d Amphibious Truck Comany with 13 DUKW's. Personnel of the 5th Cav RCT were aboard ships by 11:00 AM and at 5:30 PM departed Yokosuka Naval Base for Korea. 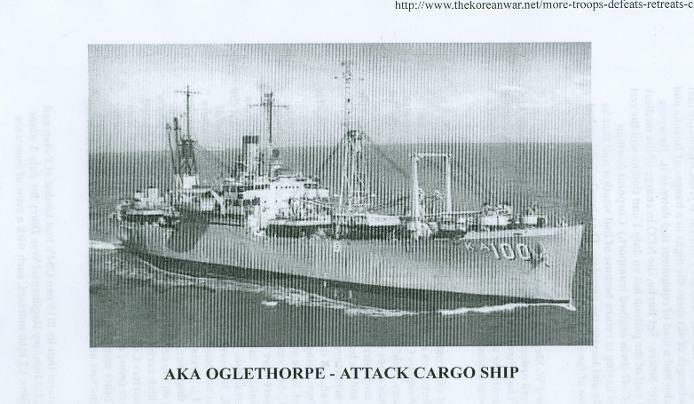 Two Japanese operated ships loaded with most of the 2 1/2 ton trucks of the 7th Cav Regiment sailed for Korea from Yokohama where they would meet the 2d lift. 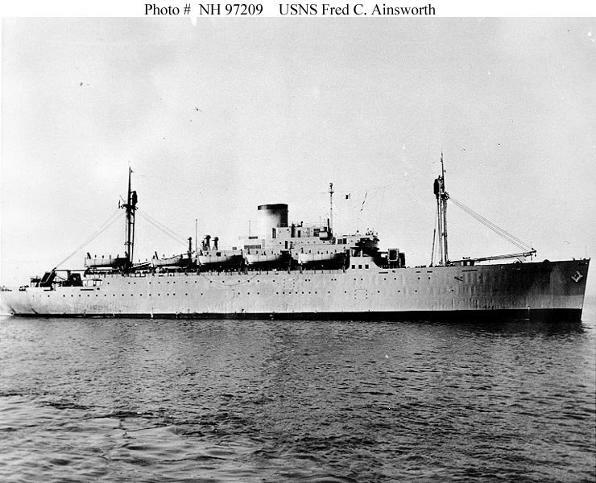 The rest of their equipment was loaded aboard the USNS Shanks and USNS Ainsworth. 16 JULY: The Mt. McKinley received predictions of typhoons and heavy seas beginning with 48 hours. Loading of the 2d lift aboard the USNS Shanks, USNS Ainsworth and USNS E.D. Patrick began. photos appear below. the 7th Cav reported they were short the following items: anti-tank mines, 4.2 HE (High Explosive) mortar ammunition, 57mm recoilless rifles, 3.5 inch rocket launchers (bazookas)and ammunition and 9 pairs of binoculars. 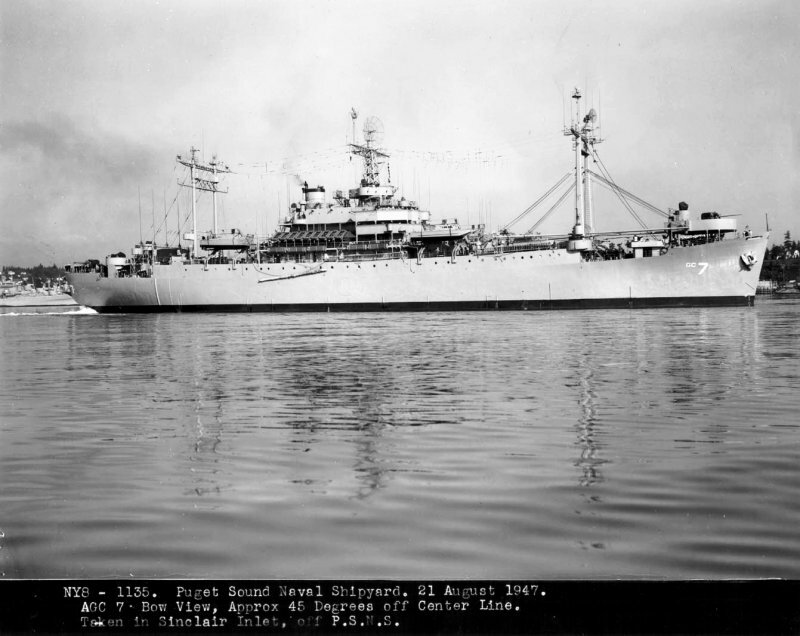 17 JULY: The second lift of the 1st Cavalry Division finished loading and sailed from Yokohama Harbor with Brigadier General Allen, the Assistant Division Commander, in command. After a conference with General Walker, the Division Advance Party sent a message that speedy unloading was imperative! 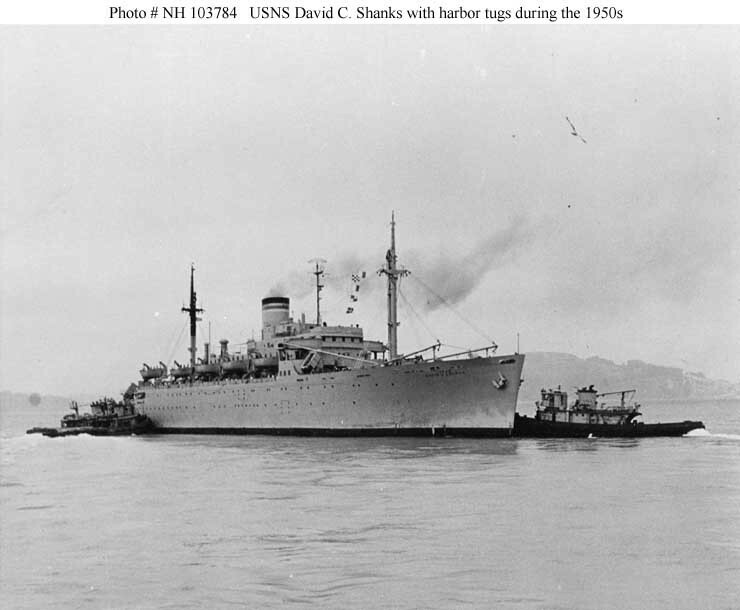 A few LST's were still unloading ammunition and supplies when a message was received from the Navy that unloading should be expedited as a Typhoon Helene was approaching and all ships had to be moved to a location which sheltered them. Unloading was completed by 5:00 PM. General Walker, EUSAK Commander, directed that the Division be concentrated in the Yongdok-Kumchon area southeast of Taejon. The last elements of the 5th Cav RCT arrived at Kwan-ni at 9:00 AM. Liaison nwas established with the 24th Division. At 11:00 PM reports were received that the 19th and 34th Regiments of the 24th Division were withdrawing to the east. This had been self-evident all day as 5th Cav units had difficulty advancing to the west due to the clogging of roads by 24th Division units all day. The plan was to relieve a unit of the 24th Infantry Division near Taejon. The 8th Cav RCT (1215 men) began leaving Pohang-dong by trains and trucks, arriving in the vicinity of Yongdong at 6:00 PM. (They were short three 75mm and eighteen 57mm recoilless rifles, all 3.5 inch rocket launchers, sniperscopes, ANGR/C6 and ANGR/C9 radio sets). A message from 8th Army stated that Company "A" of the 79th Tank Bn would immediately revert to control of the Division and that the Division would receive 158 3.5 inch rocket launchers from the 24th Division when the Division relieved them. General Gay was also informed that he would not get any of the non-commissioned officers transferred to the 24th Division and that as soon as the 64th FA Bn arrived in Korea, it would revert to the control of the 25th Infantry Division. The second lift, 7th RCT and other assorted units, were scheduled to debark at D plus 2 (today), but two typhoons were reported in the area so the convoy reduced speed and headed out to the open sea because it was not safe to enter the straits between Honshu and Kyushu because of the high winds and seas. JULY 21: The remainder of the 1st lift, including Division HQ moved to the vicinity of Kumchon. The Division was given the mission of securing Yongdong, coordinating with the Korean I Corps and the 25th Infantry Division to the right.